Specimen 15cm x 12cm The Biggenden Mine, west of Maryborough in South-East Queensland, has produced a huge range of rare and well crystallised species, including Pyrite, Magnetite, Bismuthenite, Bismuth, Gold, Quartz, the Garnet and Epidote group. Perhaps the most common species found though, is calcite. The Calcium Carbonate mineral crystallises in a huge variety of forms here, often occupying enormous vughs some meters across. 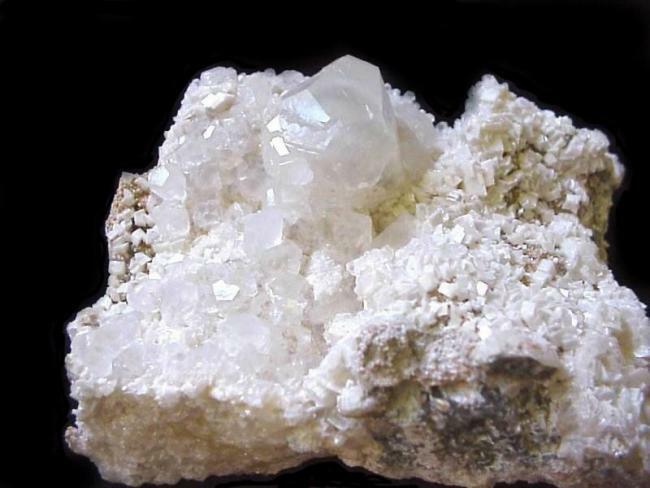 This calcite crystal is perched on a crust of pearly Dolomite. Unfortunately the mine has recently ceased operations and specimens may no longer be available.